Heavy duty pants. Suspenders. Jacket. Boots. Hood. Helmet. This is the uniform for a firefighter. On April 20, a small group of firefighters gathered at the Levant Fire Station on outer Union Street to practice their skills. That night’s objective? To test their abilities in mock search and rescue operations. Firefighters were broken up into small groups of two or three. Many of the firefighters are still very new and this provided very valuable experience. Once in their groups, the firefighters would go into a “burning building” and search for any victims. After finding the victims, they would bring their victims to safety, just as they would in an actual emergency. In this instance, instead of an actual burning building, firefighters crawled around the living quarters of the station, including the recreation room and the offices. Their victims? The station used life models to stand in for victims and in one instance a live body. According to Chief Eric Strout, this can make their jobs much easier when the time comes to put on the suit and answer a real call. For two hours, firefighters took turns crawling through the darkened hallways using small flashlights for illumination. They were given instructions prior to entering the mock situation and received further communication via radio communication. Groups had to move quickly because just like in a real fire, every second counts. This also lets the firefighters practice with full gear including air tanks. “The biggest thing is to train with the equipment that we’re wearing. We try to simulate a search and rescue as best we can. We want to get a scenario where we get the gear, we practice wearing the air pack, we want to simulate floating air. We also have down firefighters,” said Strout. Strout does admit that the training is not perfect. “It’s not as close as it’s going be to a real fire,” explained Strout. “But with the gear on, we get the simulation of how much the gear weights, and we get to breathe the air. It takes us through the whole process.” Strout also challenged his firefighters by mixing up the challenges and scenarios. In one instance, Strout blocked one of the doors that led into the main hallway after the firefighters left to search the upstairs floor for any victims. This meant that one of the teams had to find another way out of the station, something very similar to what they would happen in a real emergency. Many times firefighters can’t leave a burning building the same way they came in. Other scenarios involved the firefighters searching for a live mock “victim.” Upon finding the “victim,” the leader of the group would make sure that the victim was conscious and then the team would try and find a way out of the room while carrying their victim. Other scenarios included an instance where there were two bodies that were needed to be recovered. A video that goes along with this story can be found here. No Parking Decal? No Worries. 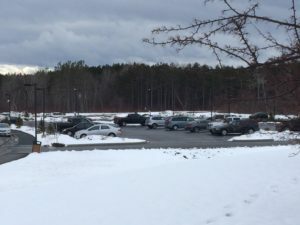 Big Changes Coming to Husson’s Parking System Next Fall.